Soil organisms tend to flourish in the habitat created by pores and gaps in soil structure, especially surrounding plant roots. When this habitat is disturbed, soil organisms can be exposed to the elements. Any extreme change in soil temperature – hot or cold, can kill these essential microbes. Soil disturbance can occur in a variety of ways including through tillage, a common practice which churns up soil and destroys its structure; the misuse of chemical inputs (pesticides, chemical fertilizer and herbicides) which interrupts the symbiotic relationships between microorganisms and plants; and overgrazing, which leads to reduced root mass and increased runoff. Nobody likes to eat the same things all the time and this includes soil microbes. 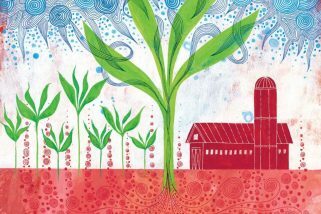 Accordingly, when plant diversity is increased soil life thrives—leading to improved plant nutrition and soil health. Practices like intercropping, increasing the diversity of crop rotations, and cover cropping are ways in which farmers and gardeners can actively improve the biodiversity and thus the health of their soils. Remember mono-cultures don’t exist in Nature! Soil organisms rely on the exudates of plant roots as an important source of food. Yet we often find large farm fields that are completely devoid of vegetation, “resting” until the next growing season. Cleared fields actually remove the primary source of food for soil microorganisms, reducing their populations and in turn damaging soil health and increasing its vulnerability. Planting a variety of cover crops in the off-season is a straight-forward way to feed soil organisms and building the soil aggregates that give soil structure. Nature keeps her soil covered and as stewards of the land we must strive to protect the Earth’s “living skin” by keeping it covered at all times too. Planting cover crops and leaving crop residues in place will do the job of keeping the ground covered. This layer of protection serves many purposes including conserving soil moisture, buffering soil life from temperature extremes and shielding soil from wind and water erosion.